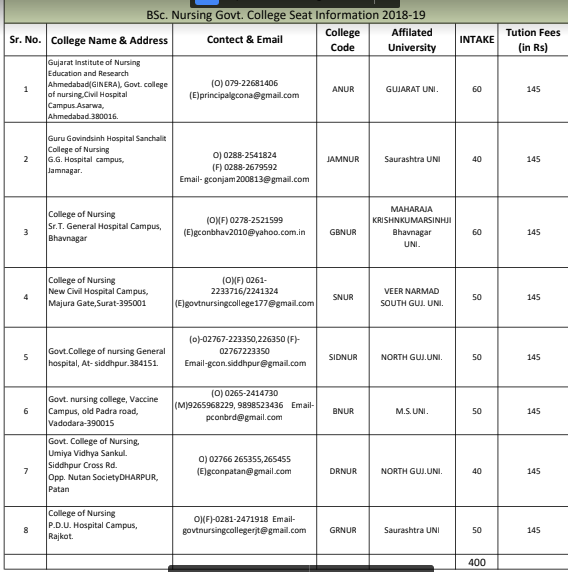 Gujarat Nursing Admission 2019 will be out soon. Candidates who are willing to pursue their career in Nursing Field can check the details out here. The Admission Committee for Gujarat Professional Nursing and Allied Medical Educational Courses Government of Gujarat, Gandhinagar conducts the Admission Process. Thus, the application form will be available soon on the website. Hence, to apply for Gujarat B.Sc Nursing 2019 Admission, the applicant must satisfy the eligibility criteria. The ACPUGMEE offers admission in BPT, BO. BASLP, GNM, ANM, B.Sc Nursing etc. The Committee does not conduct any entrance exam for this. As a result, the Admission Process is purely on the basis of your Merit Score in Intermediate. In this article, we have discussed the Gujarat B.Sc/GNM/ANM Nursing Admission 2019-20, expected dates, eligibility and much more. So, if you are planning to apply for it, then read the article carefully. In order to pursue a career from the above courses, you have to apply a GNM 2019 Nursing Application Form. You will be then offered into various Colleges and Institutions of Gujarat on the basis of the Merit. The Committee has not announced any official dates for releasing the application form yet. However, the Gujarat Admission process for 2019-20 will be soon available on the official website. The Official Notification along with the Application Form is expected to be released in the month of June 2019. The Notification will be released on the official website. Therefore, the candidates must check the Official Dates regularly to check the latest updates and notifications. We will soon update all the dates here once it is released. The Minimum Qualifying Percentage is 45% for General Category including Physically Handicapped. The Qualifying Marks for Reserved Category is 40% including Physically Disabled. Must have passed Class 12th with Science Stream, General Stream, Vyavsaylakshi Stream, Uchchatar Uttar Buniyadi Pravah Stream with English Subject. Who are Not Eligible in Gujarat Nursing Admission 2019? Candidates who have passed the qualifying exam after giving the supplementary exam are not eligible for the respective year. Widow, Orphan Child, or Committed Girl are not eligible for the admission at the school run by the unaided nursing institutions. 75% of the total allotted seats are reserved under Gujarat Professional Nursing and Allied Medical Educational Courses in the unaided schools, colleges, and Institutions. 25% of the total approved seats including 15%Non-Resident Indian Seats are reserved under Management Quota. If any management seats remain vacant, then the seat will be considered as a Government Seat. If any unaided School, College, or the Institution including the University requests to fill up the Management Seats by the Admission Committee will be considered as available for Government Seats. 15% Seats are reserved under Non-Resident Indian. If any NRI Seat remains vacant, then it will be available for the Management Quota. If any unaided School, College, or the Institution including the University requests to fill up the Non-Resident Indian Seats by the Admission Committee will be considered as available for Government Seats. The reservation of the seats will be applicable only for those candidates who are from Gujarat State domicile. The seat reservation policy is not applicable to those candidates who have migrated from other states. 10% of the seats are available for the Government Institutions for B.Sc Nursing and ONM College/Institutions (male candidates). For GNM and ANM Course, one seat each in Government GNM and ANM Schools is available for Orphan and Widow Women. The certificate must be issued by Collector/Deputy Collector/DDO etc. The Gujarat Nursing Application Form for B.Sc, ANM, and GNM will be available online. Candidates who satisfy the above eligibility criteria can fill the online form. The Online form for 2019-20 is not released yet. The Gujarat Nursing Application Form 2019 will be available for a limited period of time, therefore, the applicants must submit the application form before the closing date. Fill in the required details carefully such as Name, Educational Details, Contact details etc. Make the fee payment and submit the application form. The Committee does not conduct any Entrance Exam for the admission, in order to get admission into Gujarat College/Institution, the applicant must have good Intermediate Scores, which is your 12th marks. Hence, on the basis of your Merit Scores, you will be allotted seats in the Colleges. Hence, the candidates whose name is on the Gujarat Nursing 2019 Merit List, will be eligible for the counselling process and the final admission process. The Merit List will be available for each course and category separately. 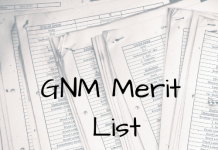 How to Download Gujarat GNM/ANM Merit List 2019? On the Gujarat B.Sc Nursing Admission Portal, search for the GNM/ANM Merit List Link. Click on the link, and soon a PDF File will be uploaded on the screen. Check your name and details and download the Gujarat ANM Merit List 2019. The merit list will be available separately for Gujarat GNM and Gujarat ANM. Therefore, check the details carefully before downloading. The Gujarat Nursing Admission will take place online. Candidates who have got the minimum qualifying marks will be eligible to attend the counselling. The counselling will take place in two or three rounds depending on the number of candidates selected. Hence, to appear in the counselling process, you must satisfy the eligibility criteria. The Gujarat Nursing Counselling Round will take place online. Candidates have to register themselves and opt for the choice of college and course. After registering for the counselling, the applicants will be allotted seats in the colleges. Further, then the student has to visit the Institution for Fee Payment and Document Verification. Candidates must note that they must visit the college on the given date and time. Class 10th Mark Sheet and Passing Certificate. Widow/Orphan Certificate issued by the Collector/Deputy Collector etc. Candidates have to carry the original as well as a Photocopy of the document. The documents must be self-attested. Candidates must also carry their www.medadamgujrat.org Gujarat GNM Application Form as well. The Committee will release the Merit List. Gujarat Nursing Merit List 2019 will be available online on the official website. The Committee will release the Merit List on the basis of the Merit List Score in Class 12th. The Allotment of the Seats will be on the basis of the availability of the seats. After the release of the Merit List, the counselling procedure will take place. In the counselling round, the candidates have to report the college/institution along with the documents. After the document verification, the applicants have to make the payment of the application fees. Hence, the Gujarat Admission Process 2019 for Nursing will be available online only. There will be no Entrance Examination. The Official Notification will be available in June 2019 in the official website. Thus, the Gujarat Nursing Admission 2019, will start from June 2019. Through the Admission of Gujarat Nursing, candidates will get admissions in B.Sc Nursing, ANM/GNM 2019. If you have any queries regarding the admission, then please comment on the section below. 4 Who are Not Eligible in Gujarat Nursing Admission 2019?